Van Halen has spanned 3 decades with their form of rock and heavy metal music, always making news and selling millions - even with a changing roster of lead singers. When Van Halen formed the band consisted of Eddie Van Halen on guitar, keyboards, and vocals, Alex Van Halen on drums and percussion, Michael Anthony on bass and vocals, and David Lee Roth on lead vocals. The conception of Van Halen began in Holland with the conception of the Van Halen brothers (the brothers grew up in California), and in the mid-70s the brothers formed a band named Mammoth with Anthony and Roth. In the late 70s, the band renamed themselves Van Halen, were flown to New York to record a demo produced by Gene Simmons of Kiss, and were signed by Warner Bros. Records. Van Halen was released with the favorites "Runnin' With The Devil," "Jamie's Cryin'," and the cover, "You Really Got Me." The LP went on to sell over 10 million copies in the U.S.
Van Halen was certified gold. Van Halen was certified platinum. Van Halen II was released with the hit "Dance The Night Away" and began their first headlining tour in the summer. Van Halen II was certified gold. Van Halen II was certified platinum. Van Halen released Women & Children First. Women & Children First was certified platinum. Eddie Van Halen received a lot of press when he married actress Valerie Bertinelli. Fair Warning was certified gold. Fair Warning was certified platinum. Van Halen hit the Top 40 with their cover of "(Oh) Pretty Woman." Van Halen released Diver Down. Van Halen hit the Top 10 with "(Oh) Pretty Woman." Diver Down was certified platinum. Van Halen hit the Top 40 with "Dancing In The Street." 1984 was released and Van Halen topped the pop charts with "Jump." Van Halen hit the Top 40 with "Jump." Van Halen hit the Top 10 and #1 for 2 weeks with "Jump." Van Halen hit the Top 40 with "I'll Wait"
Van Halen hit the Top 10 with "I'll Wait"
Van Halen hit the Top 40 with "Panama"
The video for "Jump" won a MTV Video Music Award for Best Stage Performance Video and was nominated for Best Group Video and Best Overall Performance. 1984 was certified 4x platinum, Van Halen was certified 5x platinum, Van Halen II was certified 3x platinum, Women & Children First was certified 2x platinum, and Diver Down was certified 2x platinum. 1984 was certified 5x platinum. Van Halen were nominated for an American Music Award for Favorite Pop/Rock Band/Duo/Group. Roth hit the Top 40 with "California Girls." Eddie Van Halen was nominated for a Grammy Award for Best Rock Instrumental Performance ("Doubt City"). David Lee Roth officially quit the band (or was officially fired) after releasing his solo EP, Crazy From The Heat. Problems over replacing a charismatic lead singer were conquered by Van Halen when Sammy Hagar joined the band in June. April 20: Roth hit the ARC Weekly Top 40 with "Just A Gigolo / I Ain't Got Nobody." The new lineup of Van Halen released 5150. The band was back in the Top 10 with "Why Can't This Be Love." 5150 was certified 2x platinum. Van Halen hit the Top 40 with "Dreams." 5150 was certified 3x platinum. Van Halen were nominated for 2 American Music Awards for Favorite Pop/Rock Band/Duo/Group and Favorite Pop/Rock Album (5150). 1984 was certified 6x platinum. OU812 was released with the hits "Finish What Ya Started" and "When It's Love." OU812 was certified 2x platinum. During the summer, Van Halen headlined the Monsters of Rock tour. Van Halen topped the Billboard 1988 Year-End Chart Toppers with the Top Album Rock Track ("Finish What Ya Started"). 5150 was certified 4x platinum and OU812 was certified 3x platinum. Van Halen were nominated for 3 American Music Awards for Favorite Pop/Rock Band/Duo/Group, Favorite Heavy Metal/Hard Rock Artist, and Favorite Heavy Metal/Hard Rock Album (OU812). Diver Down was certified 3x platinum and Van Halen was certified 6x platinum. Van Halen hit the Top 40 with "Feels So Good." The video for "Finish What Ya Started" was nominated for s MTV Video Music Award for Best Direction. Van Halen II was certified 4x platinum. Van Halen released For Unlawful Carnal Knowledge which contained the award-winning video hit "Right Now." For Unlawful Carnal Knowledge was certified platinum. Van Halen hit the Top 40 with "Top Of The World." For Unlawful Carnal Knowledge was certified 2x platinum. Van Halen won an American Music Awards for Favorite Heavy Metal/Hard Rock Album (For Unlawful Carnal Knowledge) and was nominated for Favorite Heavy Metal/Hard Rock Artist. Van Halen won a Grammy Award for Best Hard Rock Performance (For Unlawful Carnal Knowledge). Van Halen hit the Top 40 with "Right Now." The video for "Right Now" won 3 MTV Video Music Awards for Video of the Year, Best Direction (Mark Fenske), and Best Editing (Mitchell Sinoway), and was nominated for Best Group Video, Best Heavy Metal/Hard Rock Video, Breakthrough Video, and Viewer's Choice. Van Halen released the live LP, Van Halen Live: Right Here, Right Now. Van Halen topped the Billboard Album Rock Tracks chart for a week with "Won't Get Fooled Again." Van Halen Live: Right Here, Right Now was certified platinum. Van Halen Live: Right Here, Right Now was certified 2x platinum and Van Halen was certified 7x platinum. Rolling Stone: "The 100 Top Music Videos" included "Right Now" at # 6 and "Hot For Teacher" at # 26. 1984 was certified 7x platinum and Van Halen was certified 8x platinum. 5150 was certified 5x platinum, Fair Warning was certified 2x platinum, Women & Children First was certified 3x platinum, and For Unlawful Carnal Knowledge was certified 3x platinum. Balance was released and rumors about band conflicts began as well as Eddie Van Halen's treatment for alcoholism (which began in 1990). Van Halen topped the Billboard Album Rock Tracks chart for 3 weeks with "Don't Tell Me (What Love Can Do)." Balance topped the Billboard Pop Albums chart for a week. Van Halen were nominated for a Grammy Award for Best Rock Vocal Performance by a Duo or Group ("Jump"). Van Halen hit the Top 40 with "Can't Stop Loving You." Balance was certified 2x platinum. Van Halen hit the Top 10 with "Can't Stop Loving You." Van Halen were nominated for an American Music Award for Favorite Heavy Metal/Hard Rock Artist. Van Halen were nominated for a Grammy Award for Best Hard Rock Performance ("The Seventh Seal"). 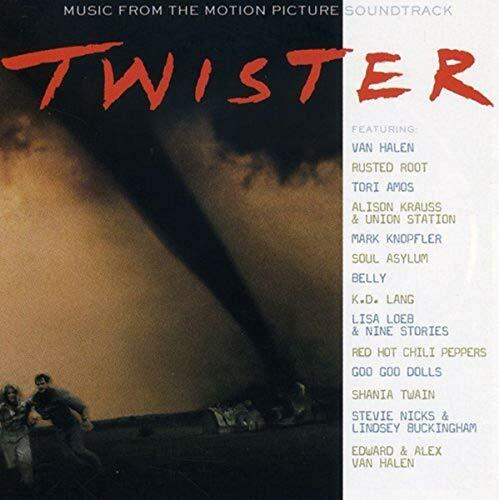 Hagar quit the band after reportedly being fired, as the group could be heard on the soundtrack for Twister with "Humans Being." Van Halen topped the Billboard Mainstream Rock Tracks chart for 2 weeks with "Humans Being." 1984 was certified 9x platinum and Van Halen was certified 10x platinum. A hit collection, The Best Of Van Halen, Vol. 1, was released and appeared to mark the return of David Lee Roth - but it was short-lived, and Roth was out of the band once again followed by publicized bickering by Roth and band members. Van Halen topped the Billboard Mainstream Rock Tracks chart for 6 weeks with "Me Wise Magic." October 4: The band replaced David Lee Roth with Gary Cherone of Extreme as lead singer. The Best Of Van Halen, Vol. 1 topped the Billboard Top 200 Albums chart for a week. Rock 'N Roll Hall Of Fame's 500 Songs That Shaped Rock And Roll includes "Jump" and "Runnin' With The Devil." Eddie and Alex were nominated for a Grammy Award for Best Rock Instrumental Performance ("Respect The Wind"). Van Halen released a brand new LP, Van Halen III, with a brand new lead singer, Gary Cherone (formerly of Extreme). Cherone was the 3rd lead singer for the band following David Lee Roth, who was with Van Halen for over a decade, and Sammy Hagar who also spent over a decade as lead singer until he quit (although Hagar contends he was fired) in '96. Cherone told the Los Angeles Times: "It seems like every 10 years they kick out the singer... so I've got 8 or 9 more years to misbehave before I have to worry about being on my best behavior. There will always be a percentage of people who will hate me because I'm not those other guys, and then there will be a percentage who will hate me because I'm too much like those other guys..." Van Halen topped the Billboard Mainstream Rock Tracks chart with "Without You" for 6 weeks. Ranked # 48 on VH1: Greatest Artists of Rock & Roll (and # 31 on Rock On The Net's Poll). The Best Of Van Halen, Vol. 1 was certified 2x platinum and Diver Down was certified 4x platinum. Van Halen cancelled a concert in Germany after a piece of plaster fell on drummer Alex Van Halen's arm during a pre-show warm-up session. The drummer was only "bruised" by the incident and did not affect further dates. Alex Van Halen's arm injury earlier this month has resulted in Van Halen canceling their remaining European performance dates. Van Halen III was certified gold. 1984 was certified 10x platinum. Van Halen lost its 3rd lead singer as Gary Cherone announced that he had left the band. Eddie Van Halen said in a statement: "Gary is a brother and he and I will continue to have a personal and musical relationship." Eddie Van Halen also underwent hip surgery in November. MTV: 100 Greatest Videos Ever Made includes "Jump" at # 33 and "Right Now" at # 61. VH1: 100 Greatest Rock Songs includes "Jump" at # 95. Reports that Eddie Van Halen had cancer of the tongue were denied by a Houston hospital. It was later confirmed that Eddie visited a Texas hospital to possibly part-take in an outpatient cancer study. Van Halen came in at # 7 on VH1: 100 Greatest Artists of Hard Rock." Rolling Stone & MTV: 100 Greatest Pop Songs includes "Jump" at # 47. Anthony said the next Van Halen LP will be "...more oriented toward the early Van Halen-type sound." Rumors continue to swirl if David Lee Roth will be returning to the band again. In April, Roth stated via his website: "About a year ago, myself and the great Van Halen band played together once or twice and it sounded amazing.... That was last July and since then I haven't been up to the studio, we haven't really been in touch, and we haven't made any music, but I am holding forth, I'm in the shape of my life and I got the high note. I'm ready to go." Van Halen responded via their website: "We're aware of all the rumors, and rumors are just that. We are continuing to work in the studio creating music for our next record. For any updates, come here to our website first. We'll stay in touch." Eddie Van Halen confirmed that he has been battling cancer. VH1: 100 Greatest Videos includes: # 24 - "Jump" and # 51 - "Hot For Teacher." Eddie Van Halen talked about his cancer: "'The way I look at it is like this, I've run too many red lights and gotten away with it for a long time, but it kinda caught up with me. I believe that God doesn't lay this on you unless you're supposed to learn something." After 23 years, Van Halen and Warner Bros. Records parted ways. Eddie Van Halen announced on the band's webiste that he had gotten "a clean bill of health - from head to toe (from cancer)." Former Van Halen lead singers, Sammy Hagar and David Lee Roth, began touring together. David Lee Roth ranked # 100 on VH1: 100 Sexiest Artists. David Lee Roth filed a lawsuit against current Van Halen members and Warner Bros. Records claiming he didn't receive royalties for previous material he was involved with. VH1: 100 Best Songs of the Past 25 Years includes "Jump" at # 11. Rolling Stone: The 500 Greatest Albums of All Time: # 415: Van Halen. 5150 was certified 6x platinum, Van Halen II was certified 5x platinum, OU812 was certified 4x platinum, The Best Of Van Halen, Vol. 1 was certified 3x platinum, and Balance was certified 3x platinum. Van Halen announced they will be touring in the summer and Sammy Hagar will be back on board as lead singer. They also released another compilation CD, The Best Of Both Worlds. # 66 on the Top Pop Artists of the Past 25 Years chart. Eddie announced that his son Wolfgang would replace Michael Anthony as the band's bass player. VH1: 100 Greatest Songs of the 80's included "Jump" at # 15. Eddie Van Halen entered rehab. Van Halen were inducted into the Rock & Roll Hall of Fame. Van Halen kicked off a tour with David Lee Roth back in the group. Van Halen put their tour on hold while Eddie underwent medical tests for concerns not made public. Entertainment Weekly: 100 Best Albums of the Last 25 Years included 1984 at # 72. The reunited Van Halen with Eddie Van Halen, Alex Van Halen, Eddie's son Wolfgang Van Halen on bass, and David Lee Roth, released A Different Kind Of Truth. Van Halen topped the Billboard Rock Albums chart and Hard Rock Albums chart with A Different Kind Of Truth. March 31: The live LP Tokyo Dome In Concert was released. Tracks: "Runnin' With The Devil" - "Eruption" - "You Really Got Me" - "Ain't Talkin' 'Bout Love" - "I'm The One" - "Jamie's Cryin'" - "Atomic Punk" - "Feel Your Love Tonight" - "Little Dreamer" - "Ice Cream Man" - "On Fire"
Tracks: "You're No Good" - "Dance The Night Away" - "Somebody Get Me A Doctor" - "Bottoms Up" - "Outta Love Again" - "Light Up The Sky" - "Spanish Fly" - "D.O.A." - "Women In Love" - "Beautiful Girls"
Tracks: "And The Cradle Will Rock..." - "Everybody Wants Some" - "Fools" - "Romeo Delight" - "Tora! Tora!" - "Loss Of Control" - "Take Your Whiskey Home" - "Could This Be Magic?" - "In A Simple Rhyme"
Tracks: "Mean Street" - "Dirty Movies" - "Sinner's Swing" - "Hear About It Late" - "Unchained" - "Push Comes To Shove" - "So This Is Love?" - "Sunday Afternoon In The Park" - "One Foot Out The Door"
Tracks: "Where Have All The Good Times Gone?" - "Hang 'Em High" - "Cathedral" - "Secrets" - "Intruder" - "(Oh) Pretty Woman" - "Dancing In The Street" - "Little Guitars" - "Big Bad Bill" - "Full Bug" - "Happy Trails"
Tracks: "1984" - "Jump" - "Panama" - "Top Jimmy" - "Drop Dead Legs" - "Hot For Teacher" - "I'll Wait" - "Girl Gone Bad" - "House Of Pain"
Tracks: "Good Enough" - "Why Can't This Be Love?" - "Get Up" - "Dreams" - "Summer Nights" - "Best Of Both Worlds" - "Love Walks In" - "5150" - "Inside"
Tracks: "Mine All Mine" - "When It's Love" - "A.F.U. (Naturally Wired)" - "Cabo Wabo" - "Source Of Infection" - "Feels So Good" - "Finish What Ya Started" - "Black And Blue" - "Sucker In A 3 Piece" - "Apolitical Blues"
Tracks: "Poundcake" - "Judgement Day" - "Spanked" - "Runaround" - "Pleasure Dome" - "In 'N' Out" - "Man On A Mission" - "Dream Is Over" - "Right Now" - "316" - "Top Of The World"
Live Tracks: "Poundcake" - "Judgement Day" - "When It's Love" - "Spanked" - "Ain't Talkin' 'Bout Love" - "In 'N' Out" - "Dreams" - "Man On A Mission" - "Ultra Bass" - "Pleasure Dome / Drum Solo" - "Panama" - "Love Walks In" - "Runaround" - "Right Now" - "One Way To Rock" - "Why Can't This Be Love?" - "Give To Live" - "Finish What Ya Started" - "Best Of Both Worlds" - "316" - "You Really Got Me / Cabo Wabo" - "Won't Get Fooled Again" - "Jump" - "Top Of The World"
Tracks: "Seventh Seal" - "Can't Stop Loving You" - "Don't Tell Me (What Love Can Do)" - "Amsterdam" - "Big Fat Money" - "Strung Out" - "Not Enough" - "Aftershock" - "Doin' Time" - "Baluchitherium" - "Take Me Back (Deja Vu)" - "Feelin'"
Tracks: "Eruption" - "Ain't Talkin' 'Bout Love" - "Runnin' With The Devil" - "Dance The Night Away"- "And The Cradle Will Rock..." - "Unchained" - "Jump" - "Panama" - "Why Can't This Be Love?" - "Dreams" - "When It's Love" - "Poundcake" - "Right Now" - "Can't Stop Loving You" - "Humans Being" - "Can't Get This Stuff No More"- "Me Wise Magic"
Tracks: "Neworld" - "Without You" - "One I Want" - "From Afar" - "Dirty Water Dog" - "Once" - "Fire In The Hole" - "Josephina" - "Year To The Day" - "Primary" - "Ballot Or The Bullet" - "How Many Say I"
Tracks: "Tattoo" - "She's The Woman" - "You And Your Blues" - "China Town" - "Blood And Fire" - "Bullethead" - "As Is" - "Honeybabysweetiedoll" - "The Trouble With Never" - "Outta Space" - "Stay Frosty" - "Big River" - "Beats Workin'"